A link in a network is determined by two factors, bandwidth and speed. These are usually the same but not always. Definition: Speed is bit rate of the circuit while bandwidth is the amount of “speed” available for use. As an example, a 500 Megabit Ethernet MPLS service which uses a 1 Gigabit Ethernet connection to site would have a bandwidth of 500Mbps and a speed of 1 Gbps. Speed is commonly determined by the physical signalling of the underlying network. The most common example is a Link Aggregation where a number of Ethernet connection are bonded into a single interface. 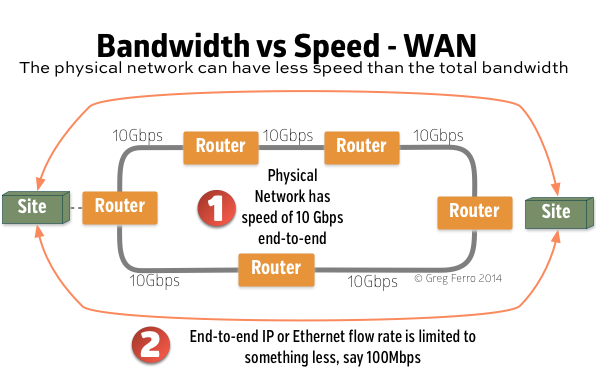 The bandwidth is the sum of the total connections but the speed is determined by the physical network connection. Another common example occurs when provisioning WAN circuits. It is common to use a high speed circuit to connect from the customer site to the carrier network but offer a “sub-rate” speed for actual use. For example, a network using 10Gbps everywhere including to your sites might only offer 100Mbps or 1Gbpps connection over the network. Isn’t bandwith and speed terms backwards? Speed – bps, Bandwidth – Bps. With analog transmission, bandwidth was the width of a frequency band and speed was the rate at which you clocked data onto that band. The digital era translated those meanings into the amount of data you could send in a given cycle. bandwidth = size, speed = clock rate.